I paused for a moment to take in my new surroundings. The scale and beauty of the amphitheatre was breathtaking. All manner of beings and beasts were assembled on the circular stepped terraces that overlooked a stone stage at the bottom. A narrow stepped path lead from where we were standing downwards to the stage, splitting the seating in two. Single paths on the outer edges of the seating allowed further access for the audience to take their seats. Mikon nudged me forward to allow the others to come in behind us. Both coyote escorts remained by my side and sat down. The rest of our procession split up to find their own seats. The architectural mastery of amphitheatres never ceases to impress me. The near perfect acoustic setting allows every audience member to hear music or actors’ words from the low level seats at the front to the last row up by the Gods where I was standing. I’ve enjoyed many a theatrical performance in my time and this spectacular amphitheatre did not disappoint. The tops of the tiered seating were covered with soft, lush grass. Not only did the turf cushioning offer a comfortable perch for spectators, it serves a functional purpose too. The soft grass creates a sound dampening effect, absorbing much of the excited chatter of the assembled while the hard surface of the limestone terracing deflects the music from the stage, like a ricocheting bullet, sending it upwards with splendid clarity. I could only guess at the number of rows of seating, easily upwards of fifty. Most of the seats were already taken. The upper perimeter was lined with tall Greek looking stone pillars, each topped with elaborate scrolls. Statues of deities from just about every ancient culture and myth I could recall watched proceedings solemnly from their stone plinths. Burning torches on sconces provided low lighting, adding a clandestine ambience. The roof was open to the stars, providing a spectacular canopy of twinkling moon dust. The full moon shone down through three gaps in the high stone wall immediately behind the stage, illuminating the platform like a lunar spotlight, flooding the area with an ethereal white shimmering light. Three bulky dark figures sat motionless on centre stage. “Looks like we’re just in time.” Mikon whispered in my ear. I felt my blood stir and my heart rate quicken as the sound of tribal drumming drifted tantalizingly up the steps to greet us. The drum beat was steady and fast, a variety of tones and rattles with a rhythmic chirp of what sounded like an anvil being struck. I could sense the collective vibration rising from everyone around me. A few of the dispersed coyotes, now seated, began to yowl softly in an irregular chorus. I looked down towards the stage to find the source of the music. A group of forest trolls sat spellbound, their thick set bodies glistening with sweat as they hunched over their drums. They sat in a ring around a large rock fire pit pounding out their hypnotic pulse with slaps of their gnarly hands. As the beat continued to build, the flames licked higher and higher. Soon flickering images began to appear at the base of the fire. Bright sparks flew from the tip of the flames, shooting upwards into the night sky. Suddenly there were gasps of delight from the audience and a ripple of excited applause. Feminine and writhing, slender figures stood slowly upright, hands joined, pulsating back and forth in time to the beat. Their fluid movements almost spilled outwards like molten lava escaping a volcano but returned gracefully back to the centre each time. Their long flowing locks were billowing plumes of yellow flames, wafting around their heads like living clouds of burning gas. Their eye sockets were intense glowing white orbs. Orange and yellow flames licked up their bodies, rippling over their naked forms harmlessly. They revelled elegantly at the sight of each other. The Goldfire elementals had arrived, emerging from the flames seductively and were treating the audience to an enchanting dance of fire. A blast of heat swept up the amphitheatre as the temperature began to rise. I looked upwards, immediately grateful for the open air design, it was already a warm summer night without the addition of a fire display. Fearing my beautiful fur might be singed, I shrank back from edge of the step. The coyotes did not seem to notice or care. The Goldfire elementals’ hands and arms were now free from one another and were undulating rhythmically from their shoulders. The effect was breathtaking. It looked like a mighty rippling fire breathing dragon was circling the dancers and moving with them. The five dainty figures interwove fluidly with belly dancing gyrations, throwing in a variety of twisting hip rotations, shimmies and pulsed their torsos agilely with hip rocks and drops. Their hands and arms rolled upwards and downwards creating loops of fire in the air. Their spines arched unnaturally backwards in a display of extreme flexibility. The coyotes’ yowls were sounding more frequently I noticed. The beat of the drums got louder and faster and suddenly with one almighty bang, they all stopped at once. The fire dancers immediately slumped forward, disappearing into the root of the fire pit. A deathly silence fell upon the audience. With the light and heat from the fire all but extinguished, a single sharp point rose slowly in the shape of a dark pyramid. When the movement stopped, I could just make out the forms of the elementals grouped together, backs facing outwards, arms outstretched upwards with all of their fingers touching to form the pointed tip of the pyramid. With the flames now doused and the base reduced to red smouldering embers, their bodies had been transformed into beautifully exquisite golden statues. A lone troll began to slap a new beat, much slower than before. A buzz rattle joined him, adding an electrical jolt quality to the sound. One by one the Goldfire elementals peeled themselves away from each other and, joining hands, stepped daintily over the jagged rock perimeter of the fire pit. Slowly they ascended the narrow stone stairs up to the main platform. It was like watching a phoenix rising from the ashes. These beautiful beings were perfect in their form. Their naked bodies shimmered and glistened in smooth gold. Reflections of nearby torches bounced off the shiny surface of their flawless golden skin. Their long flowing tresses, now extinguished, spilled down over their shoulders and around their breasts in thick disheveled golden layers. Their eye sockets were now black. But this was not the end of the dazzling show. Now on centre stage, they released each other and circled the three dark motionless shapes. In unison they sank down on their hunkers, bowing their heads in deference and brought their hands up to their faces as if in prayer. “Shanti!” The cry came from the crowd. The golden figures extended their left hands and a flame ignited in their palms. “Shanti!” The cry came again, louder. The golden figures reacted immediately bringing their lit palms to the floor. The third cry, louder still, rang in my ears. Goosebumps raced up my spine. Five points on the floor ignited with tiny blue flames that raced towards each other at incredible speed. From my vantage point up in the Gods, I could see clearly what was forming. And I was very impressed. A five pointed star now blazed on the stage surrounding the dark figures. The sign of the Goddess. Unable to contain themselves, the entire audience jumped to their feet clapping in ovation. It was utterly deafening. I sat transfixed, my heart racing in fright. The golden figures walked to the front of the stage. They stood side by side and joined hands once more. The troll drummers struck up a frenzied beat. The audience, filled with energy, danced where they stood. The five golden figures remained still. Once again the drumming headed for a crescendo. The trolls began to sing, I couldn’t make out their words but at the end everyone roared. The golden figures threw their hands straight above their heads, long spiky fingers outstretched. For a split second we were plunged into darkness. The drumming and roaring continued. I felt uneasy and leaned against one of the coyotes for support. He chuckled but allowed me rest against him. Suddenly the flames on the pentagram flared, the light from the torches grew brighter and there on the stage were the golden figures only now they looked very different. Their perfect bodies had black warrior markings in stripes and strange jagged shapes. Their golden skin had lost a lot of its lustre. Their long hair was now smooth, straight and black. They continued to dance but their movements were much more erratic and hostile than before. Slowly but surely their skin began to darken. As they gyrated aggressively around the flaming star on the floor, their bodies turned black. They looked like beautiful obsidian statues brought to life with a touch of gold relief. All that was left in gold was the tips of their fingers and toes, their full lips and eyes rimmed with elaborate golden markings like an Egyptian queen’s makeup. Mikon leaned over to my left ear. “They are so beautiful.” I sighed. The Nightshades made their way down the stone stairs to the fire pit. The audience applauded in ecstasy. One by one, the Nightshades leapt over the rocky circumference, arms folded over their chests and vanished from sight as if dropping into a glowing pool. I gazed around the audience. The steady beat of the music kept them jostling where they stood chatting in clusters animatedly. They were a curious mixed bunch. It has been a long time since I’ve seen anything like it. Humanoid guides with animalistic features draped in robes with leather and feather adornments were deep in conversation to my left. Canine, feline and reptilian faces chattered excitedly, a solemn nod of acknowledgement in my direction the only departure from their private exchange. I was suddenly aware of some jerky movements to my right. I turned to see a yellow scaly being giving me the once over. Although quite androgynous in appearance, I got the distinct sense she was female. Her head darted quizzically and her eyelids blinked from side to side over deep green eyes. Her scales though mostly yellow, had olive green exotic markings. The dark scales were raised like tiny pearlescent bubbles. Two rows of thorny spikes ran from the centre of her brow, around her head, behind her ears and merged into the nape of her neck giving the appearance of wearing a crown. Surprisingly, despite the thorny spikes, her face had delicate features including tiny holes for ears. Large olive rings encircled her eyes and dark scales defined an angular jaw line. Twitching and fidgeting constantly, her jerky movements made me feel quite nervous. She wore a semi transparent yellow sarong draped loosely around her hips. She was not in the least bit bashful as she caressed her upper body with her extremely long bony fingers with dark talons. She inspected me some more before turning to her companions with a smirk. Her long skinny fingers curled around her mouth as she whispered something then giggled. To my sheer dismay, I realized her companions were Avian. I have a real thing about birds or beings that are birdlike. They make my skin crawl. Those cold beady eyes. The twitchy movements. Those bony toes and claws. Those stiff feather wings to beat you with. And worst of all, those sharp pecking beaks! I shuddered. I have no problem at all in taking down mice, but birds are a completely different matter. I’ve been on the receiving end of vicious pecking a few times. The worst time was when I was imprisoned in a small cage and hung from a tree. Scavengers came and tried to take my eyes. I tried not to think about it. The two Avians were looking directly at me. One was all black with vivid flat feathers in green, yellow and orange. She was hominid in nature, as they all were. She did not have a beak but having any feathers is a deal breaker for me. She raised her fluffy orange eyebrows in surprise, fluttered her green feathery eyelashes and her large yellow lips formed a silent “Oh“. Her friend was much plainer in comparison, fawn coloured with black stubbly feathers on the side of her head. She had a thick mantle plume of black feathers on top of her head like a parrot. Her irises were the colour of mustard with black slits for pupils. Her eyes were rimmed thickly in black. Her face looked smooth like soft leather. But there was that beak. A small beak I grant you but a beak none the less. She was definitely Avian. I wanted nothing to do with them. “But she’s so small.” I heard one of their voices say. “Indeed, most insignificant.” Another voice agreed. “I’m telling you, that IS her.” The yellow being insisted. I turned away from the three of them and tried to manoeuvre past my escorts but was stopped dead in my tracks by Mikon. “You cannot leave now.” He hissed. “It’s those Avian creatures, I can’t stand them, they give me the creeps.” I whined. Rude? I was about to launch my protest when the first horn sounded. I looked back toward the stage. Three trolls were holding great ram horns and blowing them loudly. The coyotes on either side of me stood abruptly to attention and, when I did not do so immediately myself, moved tightly together, crushing me between them and forcing me to stand. “Hey, watch it!” I snapped, feeling my ribs pinch under the unexpected pressure. Mikon stepped down onto the first stone step in front of me. “Gather yourself.” He said softly as he moved past my ear. All attention was now drawn to some activity at the bottom of the stone stairway off to the right of the stage. The audience bowed respectfully as two large and particularly ugly trolls walked in slowly carrying long sturdy wooden poles on their shoulders. As they appeared out of the shadows, I could see that they were followed by a covered carriage perched on top of the poles and another pair of equally ugly trolls emerged into the light of the arena carrying the end of the poles behind. I say trolls, for that’s what I assumed them to be although they were much larger than the forest trolls playing the musical instruments. They looked more like stunted bald ogres. All four were heavily muscled and thick limbed. Wearing only white loin cloths and gilded cuffs around their wide wrists. Two tusk like teeth protruded from their lower jaws and the rims of their large gnarly ears were adorned with rows of golden hoops. Tiny dark eyes peered out from under heavy set brows. Moving slowly, they carried their cargo with care and precision. Onwards they glided until they reached the centre of the front row and gently swung out from under the poles, carefully lowering the covered carriage to an allocated spot. The best seat in the house. The carriage itself was taller than it was long, allowing its occupant to be seated upright rather than to recline. It had a pointed roof and was swathed in thick white fabric, completely obscuring the occupant from sight. The four corners of the cubicle were given structure with black wrought iron poles, the tips of which pierced the white fabric and were topped in an elaborate scroll design. A lavish plume of red and black feathers sprayed from a black goblet at the apex of the roof. Long gilded fringes hung from the cushioned seat under the drapes and large golden tassels swung from the top of each of the iron poles. Two curtains were draped over each other to conceal the entrance to the carriage. Both were edged with a deep black and gold border in a Greek key design. Two of the trolls stooped forward and ceremoniously eased the curtains apart, cinching the weight of them behind iron hooks on the front poles. All four made their way to the front of the carriage. Standing shoulder to shoulder they bowed deeply before taking their place, two on either side of the carriage, each kneeling on one knee. A solitary gong note sounded and all faces turned expectantly upwards to where we were standing. Taking his cue, Mikon started proudly down the stone steps as the note began to fade. The two coyotes moved forward together, forcing me to go with them. They eased off slightly as we stepped off the first step but remained close to me as we made our descent towards the stage. The pall bearing trolls remained motionless facing the stage. All other faces bar one were staring at me as I descended the steps. One by one they nodded their respect as I drew level with each row. For as much as I normally crave and love attention, I was beginning to feel quite uncomfortable. What the hell was going on here? My heart skipped a beat when I recognized the head that faced forward, stubbornly refusing to look at me, showing his disrespect in an act of defiance. Ezran. I recognized the torn ears, the large shoulders and the scraggy coat. Clearly he was still harbouring a grudge from our fight. My toes twitched again at the sight of him. Electrical charges tingled lightly up my ankles. As I drew alongside his row, he slid his eyes sideward without moving his head. Aware of my presence, he curled back his lip and bared his teeth in contempt. A cold jolt shot through my heart. I had not expected to see him again so soon. I quickly turned away in an attempt to recover my composure. This brought me face to face with another curious creature clearly vying for my attention. A feral black and white tom cat was sitting on the aisle to my right, clearly he was quite full of himself. “Hello my Queen.” He said giving me the eye and a cheeky wink. I was stunned. How dare he? Here I am with all my fine breeding, extensive pedigree and stunning good looks, not to mention my superior intelligence and supernatural abilities. And him a filthy commoner! I could have anyone I want. Just who did he think he was? There’s a protocol to such matters and he ought to be reminded that I am way out of his league. “Only in your dreams.” I tossed my nose in the air and prepared to move off. “Every single night sweetheart! Be seeing you.” He chuckled brazenly not in the least bit discouraged. I groped for some witty retort but failed. There was something attractive about the brute but there was no way I was going to admit it or reward his impudence. “For the sake of the Goddess, keep your dignity will you.” Hissed Mikon. “That. Is exactly what I intend to do!” I said as I flounced down the remainder of the steps. My escorts had to quicken their step to keep up. We were shown to a separate seating area on the front row close to the covered carriage. While the three of us took our seats on the grass covered terrace, Mikon trotted over to the front of the carriage. He bowed low in respect and there was an exchange between him and whoever was inside, however, I could not make out what was said. Being such a curious creature by nature, I kept trying to steal glances into the carriage. I could see dark shadows moving around inside but could not see in far enough to get any kind of idea of who the occupant might be. I leaned forward as far as I could go and was just about to stretch out my neck when the second gong note rang out. This time, being so close to the source, I could feel the ripple of the sound wave pass through my chest. It snatched my breath. I almost fell over in fright. All eyes were now on the three dark shapes on the stage. They had remained completely motionless the entire time, throughout the performance and the heady music. I assumed they were rocks. Turns out I was wrong. The three figures stood slowly facing each other in a triangle. Their bulky shapes were swathed in dark floor length hooded cloaks. The hoods were oversized and draped over their faces entirely. One by one they pulled a cord at their throats and threw their hands upwards to the moon in unison. The sudden movement of their arms caused their robes to slither to their feet in crumpled heaps. The three of them stood there skyclad. Have you ever seen a troll hag naked? Mikon turned swiftly on his heels, the rest of the pack falling in line silently behind him. Before they moved off, he turned and looked at me pointedly. It was clearly my cue to join them. Sighing heavily, I got to my feet slowly and gave a long leisurely stretch. Not being used to following orders from anyone other than my Mistresses, I took my sweet time in joining them. The coyotes parted, indicating my place close to the front behind Mikon. I rolled my eyes and blinked disdainfully but did as beckoned making a theatrical performance of reluctance. I was flanked by the two young coyotes that had pinned Ezran down earlier. They took their place on either side of me like a pair of Foo dogs guarding an ancient Buddhist temple. I wasn’t about to protest, I’d realized by now that the only way I was going to get through this was to meet with the Emperor as demanded. Besides, with all this pomp and fuss, my feline curiosity had been well and truly piqued. I had to find out what all this was about. I jutted my chin out in determination as the procession started to move. Some of the spectating fauna and elementals took off ahead excitedly and seemed to be spreading the word that something big was about to happen. I caught the eye of a few curious creatures as they drew in closer to stare at me. Unblinking, I held their gaze intensely, forcing them to look away first in submission. The rest of the forest inhabitants took their place at the end of the procession as Mikon lead the way. The woods were dense and much of the light from the full moon was obscured by the thick foliage of the trees and undergrowth, especially close to the ground which was just about all I could see. Soon the terrain became uneven with pebbles and started to rise up gently in front of us. I had no idea where we were going other than a vague sense of heading north, going deeper towards the heart of the enchanted forest. I almost lost my footing a couple of times as the soft earth gave way to hard stone. Smooth moss covered surfaces were exposed between jagged rocks as the vegetation mysteriously glided aside, granting us passage, and eventually revealing a set of worn stone steps. 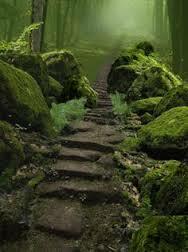 The procession halted suddenly as a soft green glowing mist materialized low over the ground blocking our path. I felt a cold shiver pass through me as the temperature dropped rapidly in comparison to the balmy summer air around us. The mist shimmered and undulated and rolled slowly forward to confront Mikon. It felt cold and clammy. Now that it was closer I could see that it was actually an entity or, more specifically, a giant floating humanoid face. Although I was only catching glimpses of it between the bodies of the coyotes, I could clearly see the top of its hairless skull, its heavy bony brow and deep dark eye sockets. A large bulbous nose hung above a wide gaping mouth with full thick lips. The cheekbones were fleshy but well defined. The edges of the apparition were blurry and appeared to resemble foliage. I smiled to myself in quiet recognition. I knew this face very well. The elusive Green Man. Renowned as a forest deity and symbol of rebirth, his image represents the cycle of growth each spring and summer in many ancient pagan cultures. He’s a protector of sorts too, every Enchanted Forest has one. “Who passes this way?” demanded the petulant mouth in a deep booming voice that made the fine branches of nearby trees tremble with dread. The dark eye sockets of the face were suddenly illuminated as its heavy eyelids flew open. Bright green eyes pierced the darkness in a cold penetrating stare. The enormous mouth made a loud sucking noise as it drew in a long breath. A few silent moments passed before it spoke again. “How can that be?” The heavy brow furrowed, the bright eyes narrowed to doubtful slits as the face drew much closer to Mikon with an aggressive lunge. Mikon stood his ground firmly, barely flinching at the sudden closeness of the face. Sensing the atmosphere was turning decidedly sour; I slid forward between the coyotes and walked towards the apparition. There was a brief stunned silence, followed by a few fluttering eye blinks of surprise before a colossal smile erupted across Gwydion’s face. He exclaimed happily before translating “I have not seen you for a while!” in the broadest Welsh lilt I’ve heard in the longest time. Gwydion. His name suited him very well. It means ‘born of the trees’ in old Welsh. I purred happily, finally a friendly face I could trust. Now that the huge face was smiling, he didn’t look anywhere near as ominous as he had just a few moments before. “Oh we go way back … further than you can possibly imagine.” I said with a wink. Gwydion was now almost giddy with glee. I felt the same way but fought to control myself. I wanted nothing more than to curl up on a comfy mossy rock beside him and catch up on old times but, judging by the impatient look on Mikon’s face, now was clearly not the time. “Have you seen Cerridwen since …?” Gwydion’s voice trailed off, his face a picture of concern. The last time I’d seen Mistress Cerridwen, we were being burned alive for witchcraft, at a time just before the ghastly witch hunt fever swept through medieval Europe. There had been no trial, only spiteful retribution over absurd allegations. Don’t get me wrong, the Mistress was in deed a witch but that had never presented a problem until a love rival was scorned. I reeled at the memory. “Well this is all terribly touching but we have business to attend to. Save the reminiscing for another time. Shall we?” Mikon attempted to usher me forward. I glanced over at Gwydion. I wanted desperately to speak to him but I had no choice in the matter. Now was simply not the time. My heart sunk with disappointment. His gentle voice filled my head. None of my companions seemed to notice. Realizing he’d spoken to me telepathically, I nodded my accord almost imperceptibly. The whole procession was standing face to face with Gwydion. The air was expectant and silent as we waited for passage. A gigantic gnarly old tree stood directly behind Gwydion. At first inspection the tree looked dead with its tangle of thick and weather beaten roots coiled intricately like a huge nest of writhing snakes protecting a large boulder at its base. Snakes, I decided, or perhaps snaking was definitely a good way to describe this beast of a tree. The girth of its trunk was vast, a good four feet at least. It distorted in several places forming knots and folds at every twist. The full moon cast an eerie light on its bark, making it look like a tortured soul, like a melting skeletal candle, the embodiment of pain captured for all eternity. Most of the branches high above were bare and jagged like long arthritic arms and fingers furled into claws as if raised in attack. I’d seen these ancient limber pines before, a symbol of wisdom and longevity to the native people and you could certainly see why. This tree had to be several hundreds of years old based on its size and form alone. Who knew how many harsh winters it had weathered or how many devastatingly hot and dry summers it had endured. It towered rigidly above us unwilling to yield. Gwydion’s eyes slid slowly shut. He took a deep breath, his lips formed a small round shape and then pressed tightly together. The long deep note started softly and continued rhythmically with each breath. As it gained in intensity and volume a strange vibration rose through my body, meandering its way up my spine, reverberating around my ribs until it settled deep in my chest within my heart. I felt myself sink into a deep dreamy place. Was this supposed to happen? It felt so good. Don’t resist, I chided myself, just go with the flow. I closed my eyes. The pitch seemed to alter my state of consciousness. I felt my body sag into relaxation. I could have sworn I was swaying but managed to remain upright with little effort. I was aware of so much in that instant, my physical surroundings, the sounds of the forest, the proximity of the others, but it all seemed so far away and disconnected somehow. The clutter from my mind disappeared as dark swirling colours quickly filled my eyelids and finally merged into a deep dark purple. I sat contentedly in my hypnotic state for what seemed like ages but at the same time, felt oddly as if no time had passed at all. I was in a place where physical time had no value or presence. Finally a single image appeared before me in my mind’s eye. It was so vivid and clear, I was sure it was real. I stared at the object in wonder. It was beautiful. 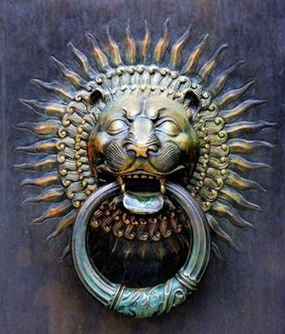 A burnished bronze door knocker in the form of a lion’s head had appeared before me. Dazzling sun rays radiated from its curly mane and a large ring hung from its open mouth. Verdigris had settled into the intricate design giving it the appearance of antiquity. It looked like a doorknocker to a mystical temple. Instinctively I raised my arm. Although the image was crystal clear in my mind, the movement came from my physical body. I extended my claws gingerly to touch it and was instantly gratified at the sound of dainty clinks as my nails connected with something firm and metallic. I placed the pads of my paw on the base of the ring and held it there, savouring the cool feel of the bronze, and the tingly energy it was emitting. Gently, I picked up the ring and gave three sharp knocks. An ear splitting grinding sound snapped me back to the physical world. My heart thundered in my chest at the sound of heavy stone being dragged over stone followed by another sound, like twisting and ripping roots. The ground rumbled beneath my feet. A portal was being wrenched open before me at the base of the old tree. The portal was framed by a simple stone archway. Dust particles floating in the air obscured the view immediately beyond the opening for a second or two until the grinding finally stopped. The view beyond the archway was truly spectacular. We were now standing at the top of a stone stairway that descended into a magnificent amphitheatre. The gnarly coyote lay on his side groaning, a good ten feet or so away from me where he’d landed heavily. He seemed momentarily dazed but was recovering quickly. Whereas I had thought him a mean savage before, he was now upping the stakes to terrifying! The assembled fauna seemed to appreciate the spectacle immensely. Their shrieks and woops rose to a deafening fever pitch. Keeping a safe distance around us, they were no doubt relieved they were not the focus of attention of this huge tormentor for once. They were baying for blood and began heckling the coyote cruelly. “Why you little vixen!” the coyote growled. His eyes narrowed to slits, his lips curled back, displaying a full set of jagged teeth. The hackles stood up on the back of his neck, making him seem even larger than before. He held his head still as he came towards me, eyes never wavering from mine. In the blink of an eye he’d closed the gap between us and was just about to attack when a loud piercing voice from behind me stopped him dead in his tracks. His cold eyes darted to the source. A strange hush fell over the pack. The adrenalin was still coursing through my veins; I used the distraction to my advantage. I was so wrapped up in my own self-preservation, I didn’t care who the voice belonged to. All I cared about was defending me. Kill or be killed, it was as simple as that. With the loudest hiss I think I’ve ever made, I struck out hard and fast with my right arm, all five claws fully extended. I went for his face. My razor sharp hooks connected with his long soft nose and dragged deeply to its cold, wet tip. The coyote howled again in excruciating pain. I’d landed a good one and was rewarded by a trickle of ruby red blood dripping from his nose. “Ezran, I said NO! !” The authoritative voice boomed loudly again. As I lay there on the ground, my eyes squeezed tightly shut, bracing myself as I waited for my neck to snap in the coyote’s powerful jaws, I heard another two grumbling voices approach. Swift feet accelerated towards me on the soft earth. I felt a sudden shift in the weight above me and heard a soft ‘ooffph’ noise to the side followed by the sounds of a struggle. I opened my eyes with trepidation, not sure what to expect and was surprised to see two young strong coyotes wrestling with the large gnarly one. It took them a while to subdue him. He’d worked himself into a rage but finally they pinned him down. I could see the sheer loathing in his eyes as he continued to glare at me. I looked behind me to see who my saviour was – my heart skipped a beat as I found myself looking directly into the eyes of another large coyote. My body sagged with fatigue; I did not have the strength for another fight. However, this second coyote seemed different. He was not quite as large as the gnarly one, although not far behind. There was a completely different aura about him. I’d assumed ‘Ezran’, if that was his name, to be the alpha male. I thought he was the leader of the pack, a large marauding bully but apparently I was wrong. The other coyotes rushed up to greet this new comer. They were excited, highly animated but very respectful at the same time. Some of the coyotes bounced close to him, others rubbed his nose with theirs. He allowed them to honour him with their greeting rituals and after a few moments he stepped forward to address me. There was an almost regal quality about him. His coat was sleek, clean and well kept. I couldn’t see any scarring or cragginess about his body or fur. His legs were long and muscular, he held himself with pride and dignity. His whole manner commanded an air of respect. He was clearly very important, the pack leader I assumed correctly this time. His honey coloured eyes were rimmed with black; he looked intelligent and wise. Just at that two small pups made their presence known as they rubbed themselves against his legs. They clearly adored him. He looked down at them kindly, nudging them gently out of sight with his nose before turning his attention back to me. The pups stared at me with avid curiosity from behind their mother, their eyes round with wonder and awe. I don’t suppose they’d met a familiar before, certainly not one as renowned or as captivating as me. Too exhausted to speak, I could only manage a grunt in acknowledgement. An Emperor indeed! Who were these creatures and why was I here? I looked down at myself, I was a wreck. I smelled like the gnarly coyote and it made me sick to my stomach. I had to get that disgusting smell off my body. I noticed a patch of open earth just off the beaten track to my left. I couldn’t resist. I threw myself down with reckless abandon and cavorted shamelessly. Forest soil has a wonderfully woody musky scent, perfect for eliminating unpleasant odours. Dried oak moss lichen from surrounding tree trunks peppered the ground in bushy clumps adding an exquisite sharp but slightly sweet and lingering base note to the fragrance. The aroma was sensual and heady. I was in absolute heaven, my brush with death all but forgotten in the throes of ecstasy as I rubbed every inch of my body into the ground. The pack leader raised his eyebrows at such undignified behaviour but said nothing. I lay there for an extended moment or two, luxuriating in my dry earth bath. Inhaling the intoxicating aroma sparked distant memories of ancient temples and seductive sorceresses I’d once known. Despite the obvious physical exhaustion from my ordeal, I felt invigorated and alive. My attention snapped back to the present when a tussle kicked off suddenly as Ezran finally broke free of his restrainers. Humiliated, he disappeared into the depths of the forest but not before he managed to hiss me a threat. I gave the fleeing coyote a sly sideward glance and began rubbing my fingers together. My damned fingers and toes were itching again. I must admit, weird though it was, it wasn’t a wholly unpleasant sensation. The tingles remained mild but as I looked down at my hands, I was surprised to see that they were glowing faintly once more. The pack leader chuckled as I got to my feet. My what? What was he talking about? Then it dawned on me. My telekinesis was returning. I turned my face to hide my smirk. I had not expected that. This life had suddenly become much more interesting. Telekinesis. The ability to move inanimate objects at will. The coyote leader had assessed my ability quite correctly. My prowess, as he put it, was indeed connected to the elements: air, earth, water and let’s not forget fire. Simply put, it means that I have the ability to harness the power and attributes of the elements, to manipulate objects and situations around me using my mind. I hadn’t meant to use it on Ezran, it just happened. Heck, I wasn’t even aware I had that particular power! I’d been acting purely on instinct. I’d tapped into the electrical charge present in the air due to the thundery weather and plunged it into his body. And very effective it had been too. Now the weird tingles and blue vapour made sense. I was quite literally manipulating lightning bolts … although I still wasn’t clear on how I’d done it. Meh, a miniscule detail. I’d get it. Eventually. I’ve never experienced an electrical discharge before. Sure, I’ve set fires, summoned fog, and shaken the ground at will on many an occasion but I’ve never experimented with the element of air, never had to. If the coyotes and other forest inhabitants wanted to assume that I had full control over the elements then who was I to argue? I only hoped that my little demonstration would keep them all wary … enough to keep me alive. The only cloud on the horizon, if any, to my new found ability was the realization that most newly acquired paranormal abilities, restored or otherwise, tend to manifest at times of extreme physical or mental stress. Especially in the beginning. Did being pawed, licked and mauled by a vile and vicious coyote constitute extreme physical peril or mental distress? You bet it did! I chuckled at how fast I’d blown Ezran right off me. I sincerely hoped the next time we met, and should I feel the need for a few more lightning bolts, that I would at least know what I was doing with them! I had no idea how long a full Restoration might take or even how many of my former skills I could expect to recover. I had some pretty special powers back in the day and, like old and influential friends, I very much looked forward to being reacquainted with them. I’d mastered the manipulation of the other elements quickly and easily enough in the past; I didn’t doubt for a second that I’d master these lightning bolts given time and ample practice. For the first time in a long time, I began to feel confident. And powerful. I liked it, I liked it a lot. I was still on high alert. My senses were tingling but, oddly, so were my feet. I felt the prickles of tiny electrical charges flowing up through my body. My muscles and limbs felt light and ready to launch a counter attack at any second should I need to. Time seemed to be slowing down. I was aware of so much around me with every second that passed. I held my position close to the ground and waited in agonizing silence until the first move came. My nerves were beginning to unravel. I was aware of faces coming forward from the undergrowth, making their presence known. I could see them clearly now. The full pack was assembled and sat in a close ring around me. With a lightning quick sweep of my eyes, I estimated a dozen gleaming sets of fangs were easily within arm’s reach. They were already excited, unable to contain themselves, they fidgeted and jostled each other, yipping and yowling. My heart burned in my chest with fear. Beyond the circle of fangs I noticed the shimmering orbs of light were assembled also. A wide variety of otherworldly faces took their places, keeping their distance and peering out from behind the safety of the trees. The twinkling glows from each of the elementals as they chattered excitedly seemed entirely wrong for the severity of the situation. The ethereal lighting created a surreal ambiance, that of a friendly gathering lit by fairy lights. In reality, I felt like an imprisoned Roman Gladiator forced to fight to the death for my freedom against a raging lion. Was that why I had been summoned here? I wondered. Was I no more than a spectacle of entertainment for the blood thirsty inhabitants of the Enchanted Forest? What would it feel like to be torn apart by this savage pack? I prayed it would be quick. I was so scared; I almost choked as I tried to swallow my nerves. I tried to remain calm but realized I had been holding my breath with dread. My head was beginning to swim and I was feeling faint. I did not want to give up. I let out a long reluctant breath and gulped in some fresh air. If this was it … there really wasn’t much I could do about it. I resolved to die fighting. A dark silhouette skulked along the beaten track towards me. Its head hung low as it trotted purposefully. I kept my own head down, my bulging eyes felt like they were out on stalks. I did not want to commit my head in one direction or another for fear of leaving an ambush opportunity on my blind side. This was surely it. I held my breath again and waited. The silhouette came to an abrupt halt in front of me. There was no mistaking what it was now. In any case, the smell had long since given it away. My eyes simply confirmed what I already knew. A large gnarly coyote stood only a few paces away. Way too close. My claws were out and at the ready. My feet were now throbbing painfully. The coyote was huge and dangerous looking, much larger than the others around me. He was the biggest coyote I’d ever seen. I was rooted to the spot in sheer terror. His fangs were easily the size of my head. His cold pale eyes bored right through me in a cruel stare. He moved with a disturbing and unpredictable gait. His dirty coat was straggly and he had many scars around his head and body. One of his ears was badly mangled. I had no doubt he had survived many horrific battles, he bore the hideous scars to prove it. He was a cold hearted killer and I feared I was about to become his next victim. He regarded me ominously, his face and fur matted with the blood and rotten flesh of a dead creature. The stench of him was overpowering. I could barely breathe. Ludicrously, considering the peril I was in, my mind wondered fleetingly where the blood might have come from, a deer carcass perhaps. It must have been large, for there was so much blood. Whatever the poor creature had been, it had clearly been dead for a while. I tried to control myself and resisted the urge to gag. 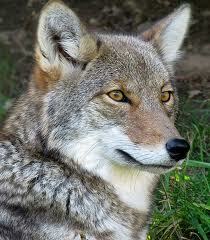 “Well, look what the cat dragged in …” the coyote sneered sarcastically. Even from where I was crouched on the ground I could feel the heat of his rancid breath. My ears pricked up at the mention of Esbat, a ceremony that is very familiar to me, I’ve always been an enthusiastic participant. All my previous Mistresses have indulged in this monthly observance where they honoured their Goddess of choice and gathered to perform magic, most often under the auspices of a full moon such as tonight. It is a time of much celebration and light. My spirits rose a little in hope at the thought that there might be a resident witch that would surely recognize my worth and take me into her protective patronage. If only I could get past this dreadful gatekeeper, this hound from hell. Fresh from his apparent feeding frenzy, I could sense he was still agitated and was pacing around irritably. I didn’t think my heart could beater any harder, but it did. “The Hags have already started their Moon ceremony and will not take kindly to an interruption.” He hissed. And suddenly I did not like the sound of the Hags at all. I assumed the ceremony the coyote referred to was the beautiful and powerful Drawing Down the Moon rite where a High Priestess invokes the essence of the Goddess directly into her body and channels her words. This is normally a very uplifting and profound ritual, even to invited spectators. Whilst any self-respecting witch would naturally take steps to ensure they were undisturbed, they are quite often naked during their commune after all, there seemed to be a sinister undertone to the coyote’s words. It sounded like a veiled threat to me. All of the moon rituals that I’ve attended have been performed by good witches. They harness the enhanced magical power of full moons for the greater good as well as their own self-development. I had no idea what a Hag might be capable of. The tension in the air was mounting. The coyote’s behaviour was clearly influencing the others; I received a few prods from behind from pointed noses and a few sharp nips to my hind quarters. They were goading me into action. I refused to give them the satisfaction. I stood my ground, despite the excruciating pain in my feet. The pain had grown so bad now; it was starting to travel up my legs. I almost wailed in panic at the thought of being incapacitated, of not being able to defend myself or worse, not being able to run away. I drew my head even tighter into my shoulders, the last thing I wanted to do was to expose my neck or throat to them. I know how coyotes kill their prey. I had no intention of making it any easier for them. The gnarly coyote moved towards me. He was still sneering. Foul smelling saliva dripped from his fangs as he sniffed me all over, openly savouring my scent. I felt drops of saliva land on my lustrous fur and trickle down to the roots. He was drooling. Then suddenly he licked me from the left side of my face all the way past my shoulders and down my back, covering me in his stinking slime. Repulsed, my body convulsed sending rippling quivers up my spine, my stomach lurched in a protest of disgust. I felt violated and utterly sickened. My coat felt sticky and hot against my skin. Then I felt the pinch of his incisors nip the back of my head close to my neck. It was all too much. I couldn’t take any more! It was at that point that I finally exploded releasing all of the pent up fury, rage and power I had. It was as if I was possessed by a demon. In an instant I was on my back. I knew I wouldn’t have time or the strength for a long battle. I was screaming like a banshee, my claws were flailing wildly; I was tearing out great chunks of his fur, drawing blood. I’d caught him completely off guard. 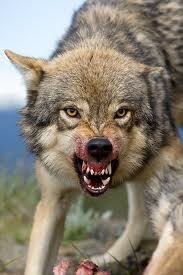 He yelped in surprise and began snapping and snarling viciously. I was acting purely on instinct. I sunk both front sets of claws into his soft throat and held on, I bared my own fangs and bit down with all my might … the red mist descended and then … ZAP!! The huge coyote gave a blood curling scream and flew off me. It was as if he’d been yanked away suddenly by a powerful unseen force. I opened my eyes in time to see what looked like pale blue tendrils of dissipating smoke. I was completely bewildered and stared incredulously at my hands, claws still clenched, tuffs of blood soaked fur lodged between my fingers. I couldn’t understand what had just happened although I couldn’t help but notice that my feet felt much better. I spat the fur out from my mouth and wiped my tongue on my forearm. I scrambled up swiftly and braced myself for a second attack. My story begins in the summer of 2008 when I was living blissfully wild on a large acreage immediately to the south west of the City of Edmonton in Alberta, Canada. It was extremely hot as I remember. I’d been living life large, a fine country existence, gorging on prime field mouse steak and languishing in the strong Albertan sunshine. I amused myself daily exploring the grasslands and wooded areas in and around the lands of the Enoch Cree Nation. Life was good. I’d had limited exposure to human folk up until that point in this life. The human folk from the old house would sporadically leave milk or water for me and the other feral cats and sometimes they’d treat us to leftover scraps of food. The only cloud on the horizon at the time was the gang of marauding coyotes but they were more of an irritation than threat to me. They would howl and yip throughout the night which, believe you me, becomes most tiresome when living at such close quarters. I’d had a couple of confrontations with them on occasion, the young ones trying to make a name for themselves as they plundered what they could from the area. They never really bothered me, I was much too smart for them but they were a mischievous bunch. I’d heard many a worrying tale about their antics and raids, some of them shockingly violent and blood thirsty and so I remained wary of their presence. It all started the week leading up to the full moon in July. The Buck Moon as it is known by many of the native bands in the area, where the new antlers of buck deer begin to push out from their foreheads in coatings of velvety fur. I prefer to think of it as the Thunder Moon myself since it occurs exactly in the middle of the spectacular thunderstorm season we see here in the Prairies. On that first night, I could not settle. I fretted and paced, I was inexplicably anxious beyond belief. My dreams were vivid and disturbing. I barely slept. Something was pricking at my subconscious frustratingly just beyond my comprehension. I realized on a deep level that the dreams were probably messages but at the time they did not make sense. I experienced a sensation of déjà vu as many of the images were strangely familiar. As it turned out, I was receiving glimpses of my previous lives, long forgotten places, mistresses and deeds. My ancient knowledge was returning. It came to me as a battery of rapidly flickering images in my third eye with little time to absorb what I was seeing. I felt like all my senses were under attack. There were a lot of metaphysical and symbolic references. I knew full well what they were and what they meant. It provoked a sense of foreboding deep within me. I began to see and hear things while I was awake and soon every shadow or sound on the acreage had me on edge. Someone or something was calling me and forcing me to remember my past. I saw otherworldly beings, elementals and spirits moving around me in my physical world. Some were going about their business seemingly oblivious to me, but most were vying for my attention. I squeezed my eyes tightly shut. If I couldn’t see them then perhaps I could convince myself that they weren’t really there. But it didn’t stop the roar of their voices. I became physically exhausted and energetically drained very quickly but at the same time I had an insane urge to travel north. It plagued me during my waking hours. I could not eat. Every time I thought about it I’d wretch painfully, the contents of my stomach long since emptied. My heart raced, my stomach lurched, my head swam and my body ached horribly. I felt lost and empty and desperate. I was utterly tormented and miserable. I realized then that I was experiencing a Restoration, something akin to the immortal Highlanders’ quickening except that the power was all mine. I’d heard about the phenomenon before but had never experienced it. I was receiving a massive and sudden cosmic download of all my previous power and mystical knowledge from past lives – except … except I was madder than hell! I had not signed up for this! I resisted with all my might and howled. In previous lives, I was born into the familiar role and trained from a young age. I knew what to expect. It was all I’d ever known and wanted. I’d chosen each and every single one of those lives. In this life I’d opted for simplicity. To live a life as a normal feline as a kind of resting reward for all the pain and sacrifice I’d endured. Some blessed peace after assisting my many Mistresses with their magic, for the greater good or otherwise. That was certainly my understanding of my most recent negotiation with one of the Akashic Record Keepers. For once, I wanted to experience life as a simple creature. It was unbearable. I was completely overwhelmed. On the first night of the full moon, I finally succumbed. I allowed my feet to take me where they wanted to go. As soon as I started moving, an odd sense of relief flowed through me. I didn’t think, I couldn’t, I simply placed one weary foot in front of the other, allowing myself to be drawn hypnotically northwards until I came to the edge of the Enchanted Forest on the furthest western edge of Edmonton. I’d heard stories of the forest but I’d never been there myself. In fact, I couldn’t think of anyone I knew who’d been there either. There were lots of terrifying and gory stories, each one worse than the last … the kind of stories that no-one returned from. 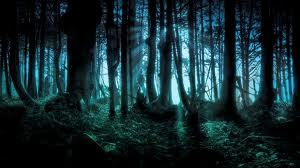 The tales were so exaggerated and wild that I almost believed the forest didn’t exist. And yet here I stood, right on the edge of it. I shivered with dread. I didn’t need the light of the full moon to know that the forest was teaming with movement. My senses were on high alert and my heart was hammering in my chest. All around me I could hear rustling in the undergrowth and twigs snapping under many feet. I could hear the moans and groans of the other worldlies as well as the cries and sounds of the breathing forest creatures. 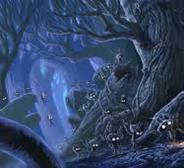 Strange lights glowed and dimmed as they moved gracefully amongst the trees. Shimmering ghostly faces appeared and disappeared as if eyeing me up for ambush. Luminous eyes blinked from everywhere I dared look. And that smell … the rancid odour of death and decay reached my nostrils. Coyotes, fresh from scavenging a dead body. I felt my bowels loosen and my stomach clench. Then suddenly the dense bushes directly in front of me parted and seemed to invite me in. The light from the full moon illuminated a narrow beaten path. As if in a trance, I was drawn hypnotically forward. I couldn’t stop myself. My hair stood on end as I heard an abrupt loud rustling noise and realized the bushes had closed in behind me. I flattened my ears against my head, sinking closer to the ground, my back legs coiled and ready to spring into action. As the adrenalin raced round my body, I was in full fight-or-flight mode. I was in the total grip of fear. They say cats have nine lives but I know this to be untrue for I’ve had so many more lives. In all but a few, where I perished before I was able to fulfil my true destiny, I have always been a witch’s familiar. Known by various names in other times and different cultures, my mistresses have all been witches, shamans, high priestesses, sorceresses, oracles and the like. All have been practitioners of powerful magic. I too have learned the craft over the eons, most often from necessity, but it has served me and my mistresses well. I have always been highly revered, in some cases almost as a deity myself, particularly where my mistress was a servant of Bast. I enjoyed those lives the most, where my appearance mattered often as much as my supernatural abilities. Human folk are superstitious by nature and I am only too happy to perpetuate this unease to my advantage. Far from being demonic or evil as was thought in ancient times, I am considered to be a guardian angel, of a sort, to my mistresses. Contrary to outmoded beliefs about familiars, I have never met the Devil, nor do I intend to. I am not and never have been in league with him nor was I ever ‘given’ as some pet demon to any of my wards to carry out their bidding. As if! I am a protector and I will do anything and everything in my power to protect what matters to me the most … my mistress. I am a most loyal servant. I have been fortunate for the most part throughout my numerous lives. I’m an old soul, most ancient in fact. I’ve negotiated all my sacred contracts through my otherworldly knowledge and special skills. Of course, the fact that I have contacts in high places, so to speak, hasn’t hurt either. I am privileged to have reincarnated into each of my lives looking exactly as I do now. There are few among us who can say that. The wisdom I have accumulated and carried from life to life has been extremely valuable to each of the mistresses I have served. It’s saved lives on many an occasion including my own, for which I am immensely grateful. My mistresses have all been powerful women. I am a coveted black cat and a much in demand familiar. I have been known by many names throughout my time but my real name is Zephyr, like the exotic lily. I like to pronounce it with panache so it rolls off my tongue as Ziffeeerrr as I purr. In ancient Greek my name means ‘West Wind’ and that’s exactly how my name came to be. Quite literally, I was blown onto the steps on the east side of the Temple of Apollo and found by a coven member serving the Pythia at the time. That was in ancient Greece as I’m sure you’ve realized, approximately 1229 BC by your methods of keeping time. A strange and sudden wind had whipped up mysteriously that day outside the city, conjured by the Oracle of Delphi herself. It spun into a tight twisting column, lifting me off the ground, sweeping me westwards through the Valley of Phocis and taking me on a journey I’ll never forget. The High Priestess was determined to have me and, as I soon discovered, her wishes were never refused or left unfulfilled. She’d just taken her place at the temple due to the demise of the previous Oracle. Her real name was Aleris but none dared ever speak it. She was only ever referred to by her title as the Pythia. That was not my first life but it is one of significance that I remember. I was originally born on the banks of the River Nile in Egypt an age or two before that. On many a lifetime’s journey I have crossed paths with the same soul in another Mistress’s body. I delight when that happens. It’s as if no time has passed and we can often pick up where we left off, old friends reunited on a shared spiritual path. I always recognize their souls but they don’t necessarily recognize mine, at least not at first. And so it was the case in this life when I first met my current Mistress although it wasn’t she who summoned me to duty. No. It was a much more complicated affair than that. This is the first lifetime I have experienced such frustration and reluctance … from me I should I say, not from my ward. They say you have to learn to move forward. Hmmphhh, I thought I knew so much already, what could I possibly need or learn from her? Ever since our little black cat turned up on the doorstep in the summer of 2008 I’ve turned into that crazy cat lady! She’s quite literally our little fur baby and the centre of our world here in Canada. She captured our hearts as well as my imagination with her bright golden eyes and her glossy black fur. A proper witch’s cat if ever there was one. Years ago, when we were planning our emigration from Scotland, we’d sit on the Prom in Kirkcaldy, looking out to sea. We drank our coffee, ate our chip butties and dreamed of what our new life in Edmonton would look like. On one such day, I announced to my husband that I wanted a cat. Not just any old cat, specifically a black one. Leaving all our family behind in Scotland, I thought it would be nice to put a little ‘heart’ into our new home wherever that might be. Pets can do that for you. The Universe must have been listening for, 8 months after our move, it delivered a beautiful black stray cat. I was stunned. And delighted! She turned up on our doorstep that first summer and refused to leave, determined to live with us and who were we to turn away such a cute house guest? I’ve always been philosophical about life and when animals ‘find’ you, I tend to take note. Nowadays, I can’t imagine not having Sheba. I’ve no idea what her history is, where she came from or what she might have seen. She’s lost the tips of both ears to the bitter Albertan winters and looks more like a cuddly black teddy bear than a cat. She regales us with stories constantly although we have no idea what she is saying. She’s such a chatty wee thing – Bagpipes really would have been a much more apt name for her. I’ve often wondered what her story is. Where did she come from, what has she been through and most importantly, why did she turn up? It doesn’t take much to fire my imagination. What if she was magical? I asked myself. Well, of course she is, aren’t all cats? What exactly does she get up to when we’re not around or fast asleep? What if we were completely oblivious to the duality of her secret life? I hope you enjoy my rambling fantasy and, if you feel so inclined, will come back and visit me again soon.